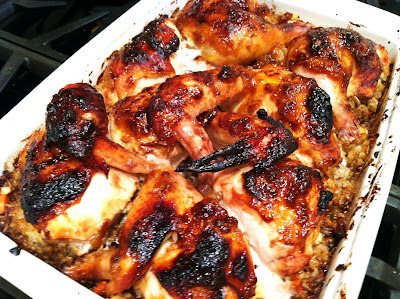 Crispy Chicken a l'Orange Baked Over Brown Rice. I can't decide if my favorite part of this dish is the sweet taste of the orange marmalade mixed with the asian flavors of the soy and honey with a bite of juicy chicken or if it's a spoonful of rice that cooks so nicely under the chicken, capturing the savory juices, and crispy pieces along the sides of the pan. Which ever part you like best, this is a winner all around. It's just as good reheated too! Bed of brown rice and uncooked chopped carrots. Top with the chicken pieces and the rest of the ingredients. 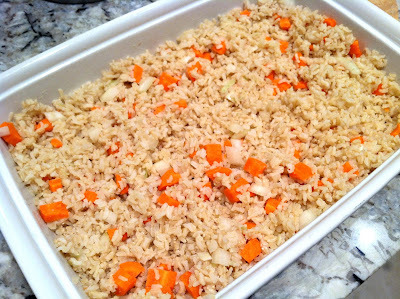 Cook rice according to package and toss with the butter and chopped raw carrots. Spread the rice mixture in a large casserole dish sprayed with non-stick cooking spray. Sprinkle the orange juice over the rice and than place all the chicken pieces in a single layer over the rice and season with salt and pepper. 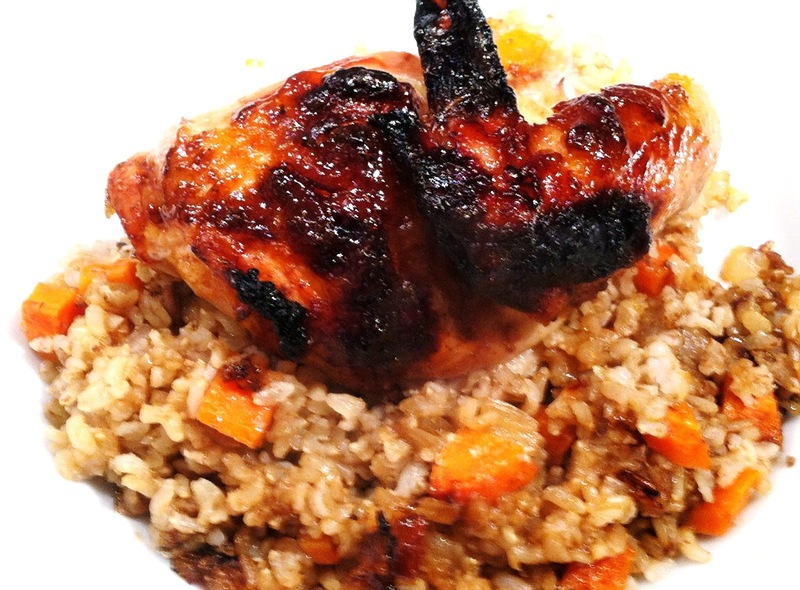 Spread a layer of orange marmalade on the chicken and scatter the rest over the rice. Sprinkle the soy and honey over the chicken and rice. With the back of a wooden spoon, poke a few wholes in the rice to allow the juices from all the ingredients to get into the rice. Bake uncovered for 50 minutes and once browned, cover loosely with foil and let cook another 10 minutes until the chicken is cooked through and the rice is brown, bubbling and a little crusty on the edges.